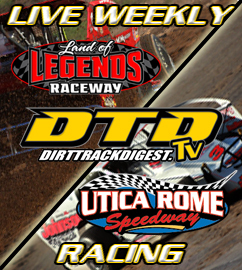 VERNON, NY – Donath MotorWorx Central New York Speedweek came to a close on Sunday night at the Utica-Rome Speedway with another different winner in victory lane while a familiar face was able to grab the week long championship. Matt Tanner, of Stephentown, N.Y., utilized the outside lane of the speedway to work his way from 12th up to the top spot to score his first win of the 2018 season with the Lucas Oil Empire Super Sprints. Tanner earned $2,500 for winning the E & V Energy, NAPA Auto Parts, Mach 1 Chassis 25-lap feature. Danny Varin’s second place finish was enough to secure him his second consecutive Speedweek championship. Friday night’s feature winner Steve Poirier took the lead after starting second at the green. Unfortunately he was only able to lead a lap before driveline issues caused his No. 28FM to slow to a stop in the fourth corner. This handed the lead over to Saturday night winner Jordan Poirier. Jordan brought the field back up to speed in his first ever visit to Utica-Rome Speedway while Tanner was busy flying around the top side. Tanner got to second on lap three of the feature when another caution was necessary for a slowing Mark Smith. The restart was all Tanner needed to take his No. 90 to the lead. Jordan went to the bottom of turns one and two with Tanner rocketing around him on the outside to take the lead as they exited turn two. Jordan fought back on the bottom of turns three and four but it wasn’t enough to get back to Tanner. Tanner paced the field with Varin, who started ninth taking over the second position on lap seven. Jordan was searching for a faster lane which Varin took advantage of. Varin worked the bottom of the speedway in turns one and two to get around Jordan for second. The follow circuit Chuck Hebing entered the fray after starting 22nd. Hebing, like Tanner, was using the extreme outside of the speedway to make up ground. He blew by the field on the top allowing him to make huge gains in the early parts of the event. Tanner got his first major taste of traffic just before the halfway point of the race. His lane around the top proved to be the place to be as much of the traffic went to the inside groove on the speedway giving Tanner an open look to get by. This forced Varin to alter his line to move to the outside. The final stages of the race saw Varin begin to close in on Tanner as the top lane began to change. 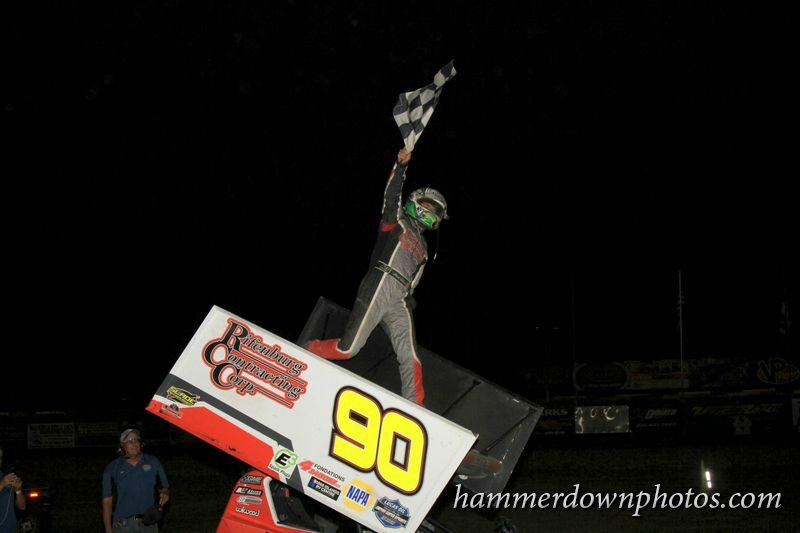 Tanner was able to ride high for the final few laps to pick up his third career win at the Utica-Rome Speedway with the Empire Super Sprints. Varin, of Fonda, N.Y., worked as hard as he could to make the bottom of the speedway go. The top just proved to be too good over the course of the race to allow Varin to have a shot at Tanner. By virtue of his solid week, which included only one finish outside the top five, Varin joined Steve Poirier as a two-time Donath Motor Worx Central New York Speedweek Champion. Chuck Hebing completed the night on the podium finishing third. Hebing worked the cushion throughout the race but could never gain enough ground to be able to challenge the top two before the checkered flag. Cory Sparks finished in the fourth position in his only Speedweek start while Mike Mahaney had his best run of the week finishing in fifth. A Speedweek high of 42 cars filled the pits on a beautiful Sunday night. Final Donath MotorWorx CNY Speedweek Points.